The tuxedo’s evolution from its 1886 American premiere to its present day incarnation has been a remarkable journey that mirrors the extensive social change that has occurred over the past century and a quarter. 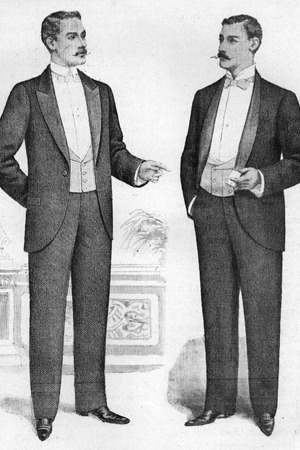 Having originated as an informal replacement for the aristocratic Victorian evening tailcoat, the tuxedo jacket was first worn with the tailcoat’s interchangeable black or white waistcoat and bow tie. By the late Edwardian era the black versions of these accessories had become the norm. The new jacket’s lapels were originally shawl style like the smoking jacket that inspired it but soon became equally popular in the more formal peaked style. 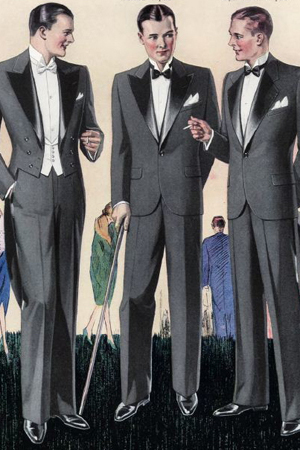 What didn’t change during this period was the tuxedo’s limited acceptability: it remained taboo at any function where women were dressed in their full evening finery. 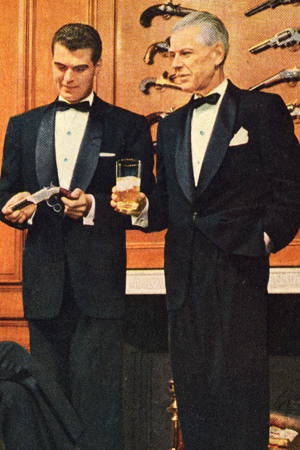 The tuxedo’s social status was elevated in the 1920s when it was adopted by the young and fashionable Prince of Wales as his evening coat of choice, thereby relegating the tailcoat to very formal affairs. 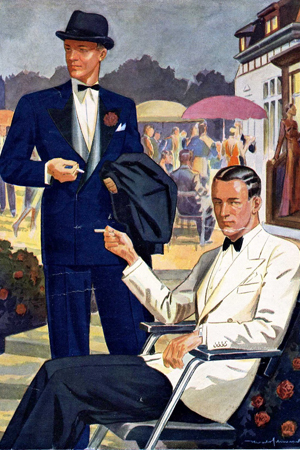 The garment then truly came into its own in the 1930s with the development of double-breasted and white versions of the jacket intended to be worn in the summer months in tandem with the new cummerbund and turndown-collar formal shirt. As a consequence, the overall outfit was increasingly defined as “black tie” to clearly distinguish it from the more traditional tailcoat ensemble, aka “white tie”. Formal clothing was largely mothballed during the somber years of World War Two and when it reappeared afterwards black tie became associated mostly with special occasions. It also lost much of its patrician cast as it was taken up by the prosperous middle class of the 1950s which favored the less formal accompaniments previously considered acceptable only in hot weather. Only the white jacket retained its tropical exclusivity although as the decade drew on its popularity was increasingly challenged by dinner jacket separates constructed of modern materials and colors that embodied the futuristic Jet Age. 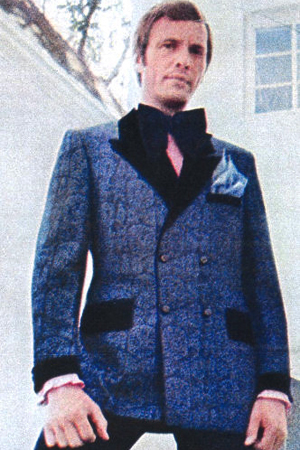 The Counterculture era of the 1960s turned men’s fashion on its head by replacing staid hues and cuts with the exaggerated colors, patterns and stylings immortalized by the Austin Powers movies (“Yeah, baby!”) At first these transgressions were limited to formal summer attire but by the 1970s all types of tuxedos were being reinvented in disco’s image with bell bottom trousers, lacey ruffled shirts and gargantuan velvet bow ties. Adding insult to injury, younger dressers began renting tuxedos constructed of pasteled polyester and wearing them to weddings held in broad daylight. Then a funny thing happened on the way to the formal: anti-establishment hippies matured into yuppies who couldn’t get enough of traditional values. The 1980s era of conspicuous consumption inspired countless Gordon Gekko-wannabes to purchase classic black designer tuxedos personalized with elegant vests while New Wave aficionados preferred skinny bow ties, matching cummerbunds and miniscule wing collars. The 1990s advent of “casual Friday” in the workplace seemed to suggest the impending demise of formal dressing but in fact only bolstered the popularity of the tuxedo in the decade leading up to the greatest New Year’s Eve celebration in history. The events of 9/11 in 2001 put a damper on lavish celebrations as did the Great Recession of 2008. The extremely casual attitude of Gen Y has also reduced the popularity of formal traditions in the new millennium while popularizing a stripped-down interpretation of the tuxedo that is often indistinguishable from a common black business suit. 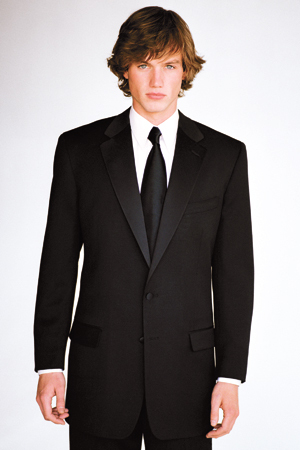 Business Suit-Like Tuxedo, Circa 2000's. Which brings us to 2011, the 125th anniversary of the tuxedo’s arrival in America. A recent return to classic styling at Hollywood red carpet ceremonies suggests that well-dressed men are once again looking to the past for inspiration. 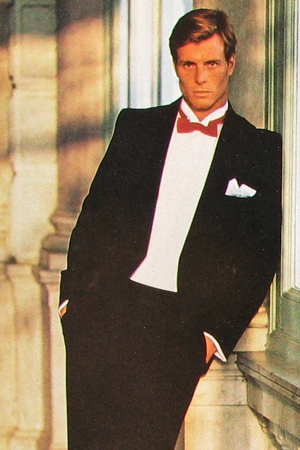 It appears that the tuxedo’s timeless qualities will ensure its historic journey continues for many more years to come . . .
Return to Classic Styling, Current in 2011. Thanks to The Black Tie Guy, now you know where the tuxedo comes from. When it comes to classic styling, knowing about the past is an important part of understanding the present and future of formal attire. 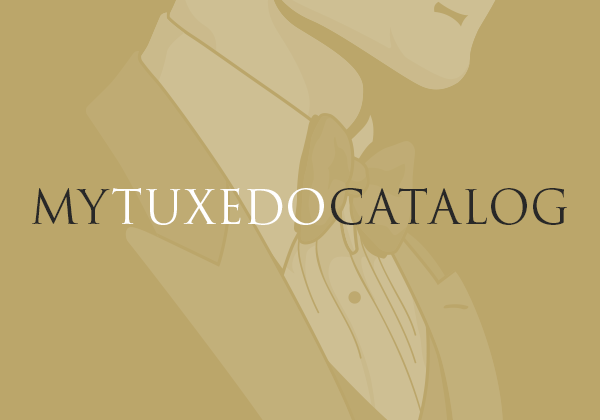 To stay up to date on the newest tuxedo trends and to find out how this 125 year long story continues, check out our online tuxedo catalog of current styles regularly! Peter Marshall (aka the Black Tie Guy) is the founder and author of the web’s go-to resource for tuxedo style and etiquette, www.BlackTieGuide.com. He is a rare scholar of all things formal and aims his focus on taking a modern look at formal tradition, where it came from, what it means, and why Black Tie attire has so well stood the test of time. Darn Right, Your Dad Wore It.